The Mission Clubhouse is on a mission! Our life-size Video Game Maze is taking shape and soon we’ll be ready to test it out! The past two weeks have been fun-filled and action packed for our three groups. ”The Water and Sky” team finished the frame of their two tunnels and are starting to add walls and secret doors. “Can’t Touch the Ground” team finished the frame to their elevator and added a door as well. Next they will be working on their pulley system for lifting it up into the air! The “Boss Toss” team also finished their suspended track (think candy claw machine) which will move the ghosts back and forth through the sky as it chases us trough the Video Game Maze! Noehmy uses the band saw to cut the floor for the elevator. Javier cuts pieces to finish the elevator frame. Team work! Noehmy, Elias, and Javier carry lumber together to the chop saw room. Elias attaches the floor of the elevator. Kai and Elias add structural supports. A job well done! Javier and Noehmy test out the movable door/entrance of the elevator. The “Water and Sky” team think about how they want their tunnels to connect together for their underwater maze. And on the jigsaw with Sarah too!!! We are on the move!!! It’s week six and the pieces are coming together. Today our group made some giant leaps forward with their life size video game maze and we celebrated by taking turns flying down the zip line elevator at the end of the day! The “Water and Sky“ team finished the sides and roof to one of their tunnels and the second one is almost finished. Soon we will have the secret passageways and connections between tunnels completed. and the tunnels are turning into a Elias and Bella brainstormed on some decoration themes to create a night sky and a bubbly, underwater environment. Stay tuned to see where these secret passageways lead! The “Can’t Touch the Ground Team” has taken off! With doors and pulleys adjusted and attached their elevator is ready for the zip line. Check out these fun test runs! The Boss Toss team attached more of their Pac-Man style ghosts and soon they will be flying and chasing us all around. Check back soon to see more exciting progress and be sure to visit our Flickr page for more photos of all the action! It’s the final countdown! Only one more week left at Willie Mays Boys and Girls Clubhouse. In the past few weeks our group finished three 8 foot long sections of train track. They even built a steep ramp off the indoor staircase to pick up a little speed! After a group design session, they also came up with ideas for the train car and (potentially) a tunnel for the train to run through. We’re all excited for this train to hit the tracks! Laniya and Audrey attach PVC pipe to lumber as the railings for our train tracks. Wisemann and Audrey use a hand saw to cut metal pipes for the axles of the train car. Several members of the group work together to build the bottom of the train car and test it on the tracks… you can tell by Weismann’s smile that it works!! Weismann tests out the train car. Neveah and Dallas draw the train tunnel together. It’s a beautiful design! The group tests multiple track pieces together. It works, but there is still some problem solving to do for the connectors. Group design session for the ramp. This ramp was built for speed! Laying the tracks… we’re taking over the whole playroom! Dallas cuts pieces for the train car. Byron and Anthony collaborate on the train tunnel. Byron and Anthony use a speed square to make measurements for multiple cuts more quickly. Pro moves! Mekai cuts metal pipe to use for the connectors between the track rails. Mekai and Brendon modify the wheels and axles of the train car to fit the PVC pipe rails more accurately. Now it’s ready to ride!!! Mekai tests the ramp for the first time! It’s even faster than we expected! Check back in next week for the grand finale of our winter session! Lots more photos can be found on our Flickr page! The Willie Mays Boys and Girls Club tinkerers are building full steam ahead! The past two weeks have been super busy! With some new materials and lots of group collaboration, the tracks are laid for our next adventure as we get our trains rolling. Weismann carried the first load up of PVC pipe for the train tracks up to the garden. At tinkering school, we always find a partner to carry long or heavy building materials. One person on each end so we don’t accidentally make helicopters! Jayden and MauRae used hand saws for the first time to cut PVC pipe. Bayron and Weismann worked quickly together attaching two PVC pipes to each rail for wheel hubs to fit the tracks. Dallas, Assada, Malia and Anthony all helped to remove the wheels from the hubs to get them ready for the train. Maia and Weismann tested the length of the axles for their train. Half of the team pitched in to help complete the base of the first train car as the rest of the team finished making the main train tracks. Audrey and Anthony made some final touches and got this train is ready to roll!!! Check in at our next stop to see all the progress this crew is making! Week 3 flew by as we jumped straight into “full swing” building mode! Our Tinkerers are improving their building skills with each new challenge, often leading to modified designs and plenty of “a-ha” moments. Our dedicated team continued to make tons of progress on their Video Game Maze elements which include an elevator, zig zag tunnels, and a suspended track (complete with pulleys!). Edwin and Anthony work on the new frame. Tightening the ropes so the pulley car can easily glide across. By building a smaller frame, replacing wheels with pulleys, and changing the placement of the ropes within the frame, the “Boss Toss” group has created a more efficient and lighter structure for their project! Vassidy and Anthony attach pulleys to the car. The car glided perfectly along the ropes! A successful test! The “Can’t Touch the Ground” team also made tons of progress building the frame for their elevator and cutting out a plywood floor. Noehmy and Elias had a chance to practice using the band saw for the first time! And this week the “Water and Sky Team” finished their first tunnel section and gave it a test run/crawl! Bella drilled the top structural supports for the zig-zag tunnel’s frame and added gussets for extra strength. Be sure to visit us next week to watch this exciting video game maze take shape! As always, more photos of all the fun can be found on our Flickr page! We hope you all had a wonderful holiday season, and are happy to welcome you back with our winter edition of the Tinkering After School Program with the Boys and Girls Club Mission Clubhouse. Last Tuesday we visited the Mission Clubhouse to meet our new crew of tinkerers and to reveal the project theme we will be working on for the next 8 weeks. as well as begin our design session. We started the day with group agreements. Each session we create custom group agreements with the tinkerers. We do this to give them ownership over their participation and to encourage them to make choices that will best support them in the workspace. Everyone signs to show that they agree, and they are giving their word to keep these agreements. Then we revealed the project… we’re going to build a giant video game maze where we will navigate all kinds of fun obstacles to complete the level!! With new inspiration, our tinkerers split into groups to come up with their own individual design ideas before combining them all into one plan. 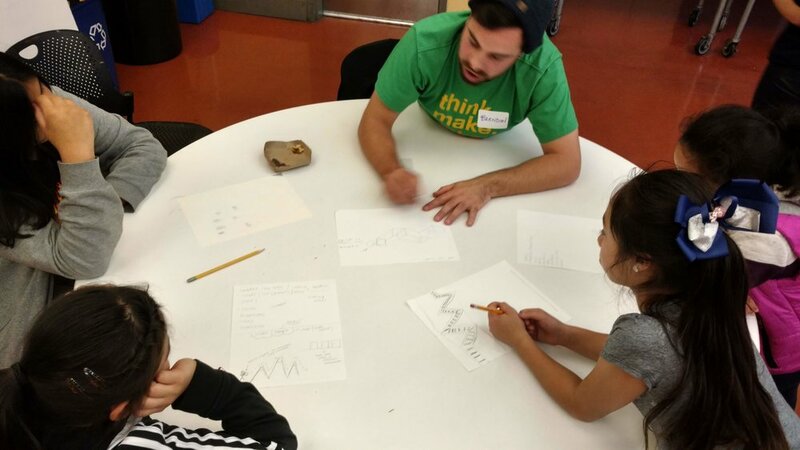 At tinkering school we focus on group projects to encourage collaboration between tinkerers. Can’t Touch the Ground Team! After we were done with our designing phase of the project, we brought the Mission Clubhouse back over to our workshop for tool training. One of our collaborators, Kai demonstrates the safety techniques and benefits for using clamps. To test out the skills they learned, Kai gave each group of tinkerers a challenge to complete with the clamps. David and Vassidy practice clamping pieces of wood to the saw horse to complete their challenge of making a bridge. Learning how to use tools isn’t all seriousness! Megan provides an opportunity for our Water and Sky team to measure how tall they want their zig zag tunnel to be. Many of our tinkerers like to come back to our programs because they have so much fun and enjoy learning new skills, as well as improving on skills they already have. Edwin and Anthony have participated in previous sessions with the Boys and Girls Club and we are excited to see them back in the shop! Last (and certainly not least) our new crew learned how to use the…CHOP SAW! (also known as a compound miter saw). Katie explains to the tinkerers the safety requirements of using this saw, including discussing the infamous blood bubble (a large area around the blade all fingers and body parts must stay out of). At Tinkering School we thoroughly go over the safety of each tool for the tinkerers, so that they feel safe and empowered when using them. Don’t forget to put on your safety goggles and ear protection before using this saw! Once our teams completed their tool training, it was time to build and put our new skills to use! So many opportunities to use all the tools and to collaborate. We can accomplish so much more when we build together! Join us next week to see what our tinkerers create next. This is going to be a project you wont want to miss! To see more photos from our tinkering time, be sure to visit our Flickr page!